My name’s Melina. Not sure if you remember me, I used to write this little bloggy here. Hope you don’t mind if I start doing that again! 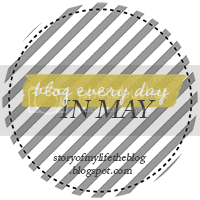 Because I love [failing at] a good challenge, I’ve decided to follow along with Jenni’s Blog Every Day in May challenge! I think it will be a great way to get back to writing, which is really why I started this blog in the first place. Today’s little assignment (it's kind of like school all over again!) is to write your life story in 250ish words. I find that fitting since I’ve been out of the blogging game for so long. A little recap if you will! I was born and bred in a small town in New Hampshire that lent to personality traits such as the ability to drive a stick and the inability to calculate sales tax. I was a loud, half-Greek child who was prone to dramatics and loved making people laugh (some things don’t change). I have one brother who’s 16 months younger than me and I highly recommend that because then you always have someone around to tie to the kitchen table and play your pet deer (true story). School was always fairly easy for me and my father would have loved it if I had applied my knowledge to law or engineering, but instead I turned 18 and headed to Boston to pursue a degree in television and film. (Kids, don’t do that.) College was whatever, but I fell madly in love with the city and spent almost the entirety of the fall of 2007 camped out in front of Fenway. Subsequently, that was the last New England autumn I saw. I interned in Los Angeles in 2008 and then, after graduating, moved 3000 miles away with less than two weeks’ notice because I was offered a job. After bouncing around in reality television for a while, I got super lucky and given the job of a copywriter for a retail website (in part thanks to this blog). I live with my boyfriend and two gigantic cats and we just moved into a pre-war apartment that has the greatest light. Soooo, there you have it. A brief history of me, Melina. May, you’re going to be a great month! i'm so glad you'll be here (supposedly) every day of may. I am new to this whole blogging thing and am pretty bad at keeping up it with as well, so I feel your pain. :p That picture is so cute, I have brother (who is 5 years younger than me) and love our shenanigans together.